Business Development Company Statistics Works? A Company hires a responsible person with skills in business development and have a database of new prospects. A good business developer will look for decision makers in an organization to approach for new business. We are a top business development company. A business developer will work closely with the management team and customers to get a proper understanding. Regular market research & new business fields are the skills which lead to new business for an organization. Skills in business development directly impact the future growth and stability of a business. And the owner of the organization looks for all necessary efforts that are required in business development. To evaluate a business developer one must determine the below-listed qualities. You can also hire PHP developers from Semidot Infotech. 1. Gather and analyze the details of the market prior to looking for new business. Proper knowledge of the market and what customer needs is essential at the first stage. 2. Strong communication skills having the ability to present and speak to different prospects. Along with the ability to engage with clients on any level. A good business developer will never back foot on any stage of communication with prospects. 3. Set the goals and work for them to achieve the targets. Proper goal setting is important to get new business and one must opt all challenges to achieve those. 4. Skills in project management where they can plan and manage projects along with time & budget. 5. Ask great questions and listen to prospects requirements to understand the vision. 6. Team handling and management for project execution. 7. Negotiation is an asset where a business developer can convince the prospect to be a client. As there might be some position where customers won’t pay as per your offer so negotiation is very important. 8. Selling a product or services is the ability where a business developer analyze the client requirement and pitch them in the correct way. 9. Be innovative while thinking about new approaches so that customers can trust you easily. 10. Build & maintain relationships with customers/ team is also an important asset for business development. The Final goal of a business developer is to increase the revenue & financial growth of an organization. Each business starts with a small step and transforms into the large size outcome. A small business development company applies several steps for the development stage. 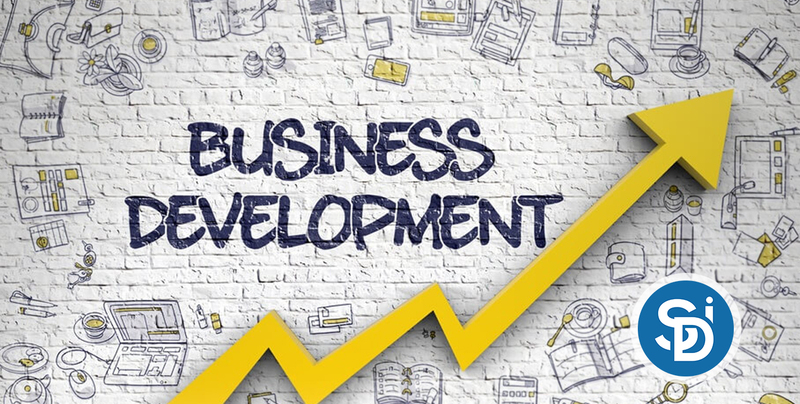 Usually, most of the business development companies follow a fixed path and share with the public who interested to work with small business development companies. Make sure small company should be registered otherwise customers will away from you in the absence of authentication in the professional world. In a small company, investors invest capital and manage company’s activities. Small companies make a countless portfolio and fetch it with upcoming projects whereby we receive extensive business development for future projects. A business analyst targets small destinations for getting high volume. Here, a business analyst does not require any kind of specific qualification for getting lids through freelance. Most of the American business development companies like to work in systematically. They keep a professional person who has extensive knowledge of the business world and tries very hard to get beneficial lids for the organization. Test advanced skills of business analyst before hiring and offer trending challenges that we face very often. You can hire AWS developers. A business development company grab a path where the company gets upcoming work continually and maintains small or medium-size business projects. Business development companies are very similar to venture capital where a group of investors invests funds in the limited budget. Small business Development Company attracts newly people easily for investment because small companies choose the fast way to provide you a great outcome. It is the main reason behind growing small companies in the world compare than venture capital.